Meet Us In The Kitchen...Because Hyperactive Lu Cooks and Bakes! 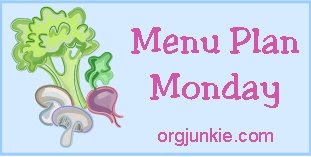 : Menu Plan Monday...errr Wednesday? Yes, I know, its not Monday. It is a little late! Thanks to my sweet Hubbie- we now have groceries! I was able to make our menu plan while feeding Grayson and now we're set until April 19th! Hubbie was able to find a lot of things at Kroger that were natural and organic. We even found some "pop tarts" that were all natural. Bubbie loves pop tarts and they are so easy to serve to him on busy morning! Our favorite ceral here lately is Kashi and Good Friends. Both have a lot of fiber and have all natural products in them. I told Hubbie to go ahead and buy some bread. I didn't do so hot last weekend with my baking, so we're out of bread. I can't seem to find time to bake during the week. I must do better this weekend!